Dementia Friendly Cowbridge (“DFC”) was officially launched by the Mayor of Cowbridge Councillor Terry Williams on Friday 25 May. Speakers included The Secretary of State for Wales, Alan Cairns MP, Jane Hutt AM, Alan RT Davies AM, David Melding AM and David Harris President of Cowbridge Rotary who presented a cheque to The Alzheimer’s Society. 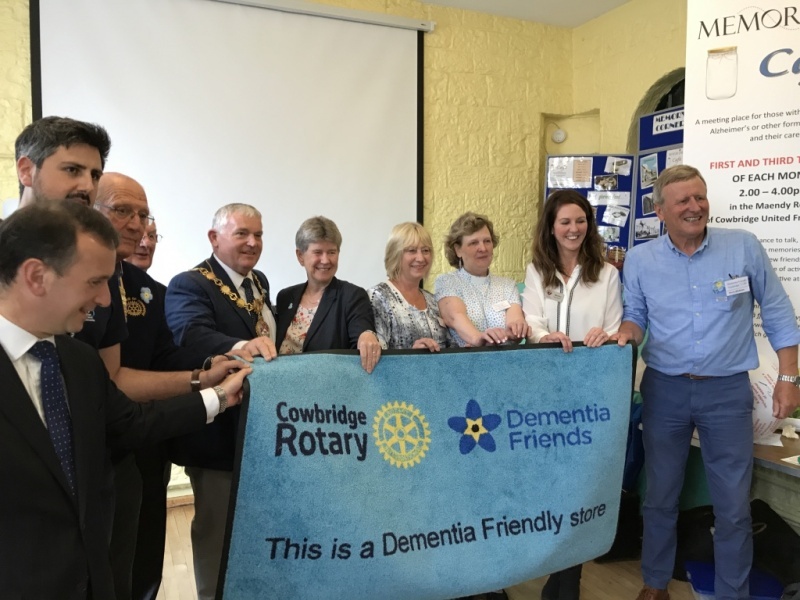 Rotarian Steven Blackman, Chairman of Dementia Friendly Cowbridge outlined DFC’s objectives which are to help build a more Dementia Friendly Community and provide support and information for people living with Dementia, their families and carers in Cowbridge. The event was held in Cowbridge Lesser Hall with experts and local support organisations including The Medical practices, Admiral Nurses, Alzheimer’s Society, Keep Safe, The Memory Jar, Golden Oldies Cinema, Age Connects, JCP Solicitors and other social and friendship activities in Cowbridge. There was also time for plenty of tea and cake in a supportive and friendly environment. DFC was started as a joint initiative between Liz George former Mayor of Cowbridge and Steven Blackman when he was President of Cowbridge Rotary. Last year Cowbridge Rotary raised in excess of £6000 which was generously matched by the Waterloo Foundation to enable a cheque to be presented to Alzheimer’s Research for over £12000. This is in addition to over £4000 Rotary has raised in the past 5 years for Alzheimer’s charities. One of DFC’s initiatives includes signing up local businesses and organisations to work towards becoming more Dementia friendly. 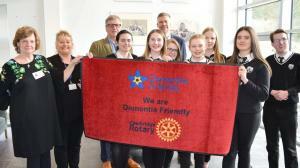 Rotarian Colin Jones came up with the idea of providing a brightly coloured entrance mat to signify that the business had signed up and made a pledge. He found a supplier and a sponsor who provided £2500 to cover the cost of providing the mats. DFC and Rotary have 14 mats in place and 10 pending. 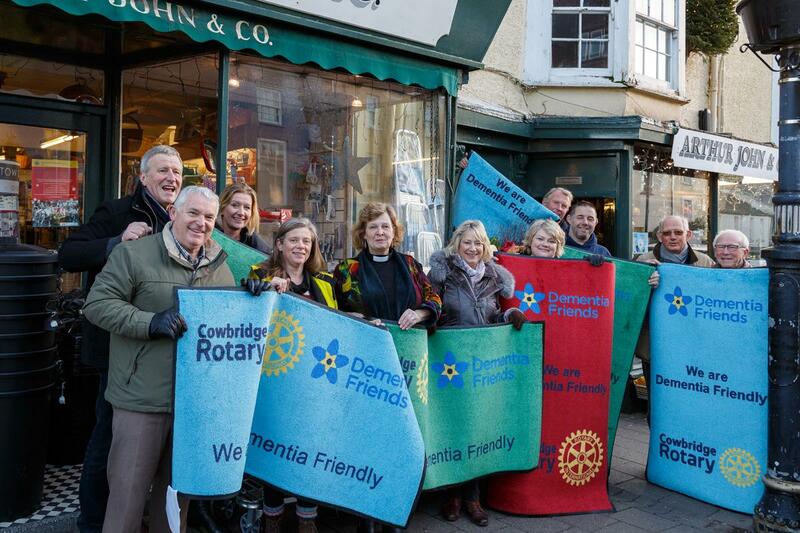 Each business has made a donation for these mats and the collected funds of £443 were presented to The Alzheimer’s Society by Rotary president David Harris during proceeding at The DFC official launch Day.